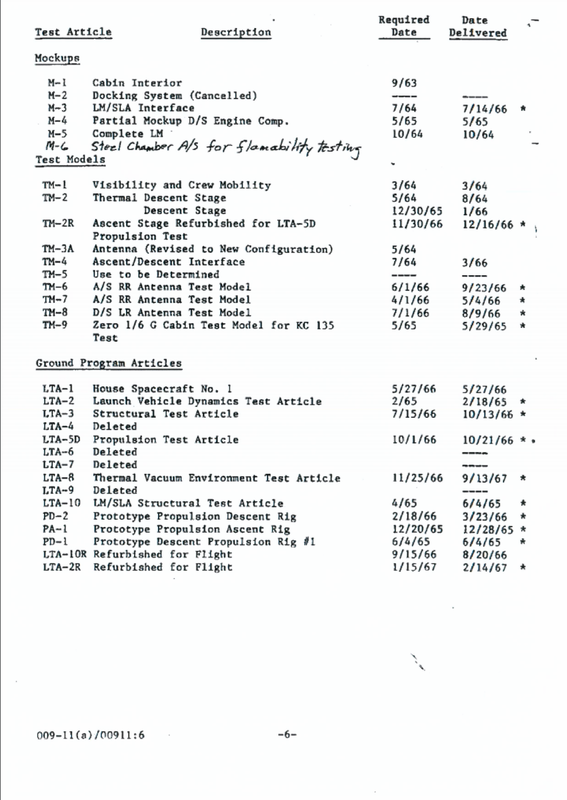 I am currently working on an chronology/article covering the construction and testing of the lunar module and seek some help in obtaining some images of certain articles. Does anyone have some images of; TM-2 (often confused for LTA-8) and, PA-1, PD-1 (or PD-2) the propulsion test rigs used at White Sands? Also good picture of TM-2 in Joshua Stoff's book "Building Moonships: The Grumman Lunar Module," although it is wrongly stated as being LTA-8 (page 78). I am asking this on behalf of collectSPACE member spacemal. Does anyone know the origin, i.e. document, of the following page please?